Happy Father's Day to all the men. What a hot and humid day for all those hotties. I hope everyone is having a great day! It's in the high 90s again. Sizzling steaks! Who needs to fire up the grill when you can most likely cook them on the glass patio table because it's sizzling hot. Yikes! 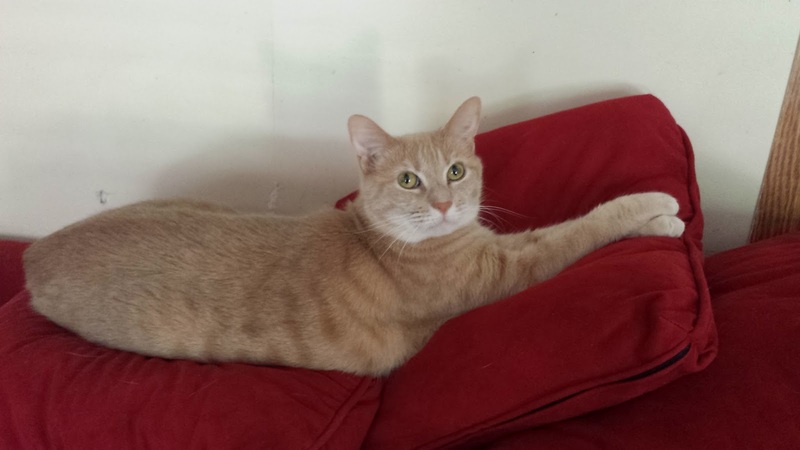 I gotta show you what my cat who's nickname is Travis ( short for Travis-A-Meow) is doing for his special day. Doesn't he do a fabulous job of modeling his special favorite past time activity. LOL. On a more serious note. My honey and myself, we are trying to make the best of it.... I only get to spend a half day with my honey before he gets back on the road in what we call his "rolling man cave" ( his 18 wheeler). I wanted to make sure he was leaving with a smile.... so....I had to make sure I made his card with a little humor. I guess I accomplished my mission...... He got a good chuckle out of the sentiment I used on his card. Actually the truth be told myself, my Daughter and Granddaughter got a good giggle or two out of it too. I hope you do too. The card is done with two layers of embossing folder designs of wood grain on the dark brown paper, and the tree embossing folder on the light green paper which has tan coloring within it. 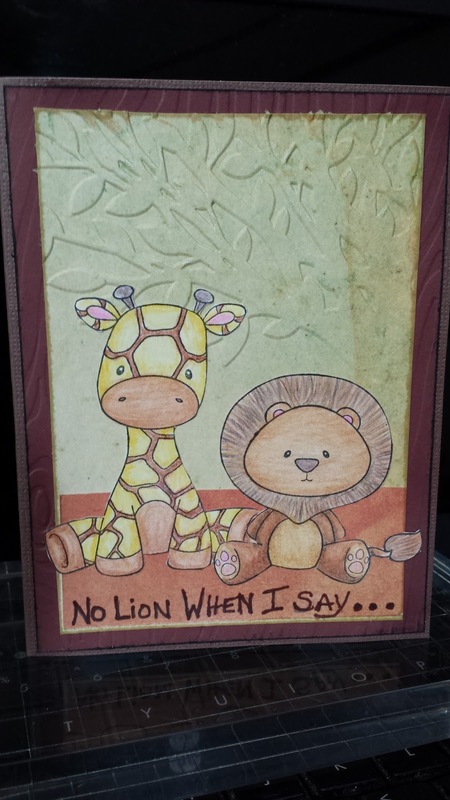 The two stamps - the giraffe and lion are both from CC Design's Safari Pals stamp set. Adorable! How cute are they?!? 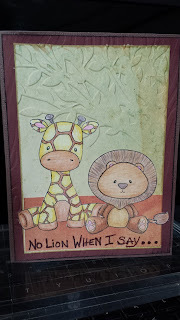 Well of course I could not resist the humor in using the word lion in my sentiment. The two cuties are colored with colored pencils. KK's card for Grandpa... She also used some stamps from CC Designs - two princesses from the Princess Stamp Set. 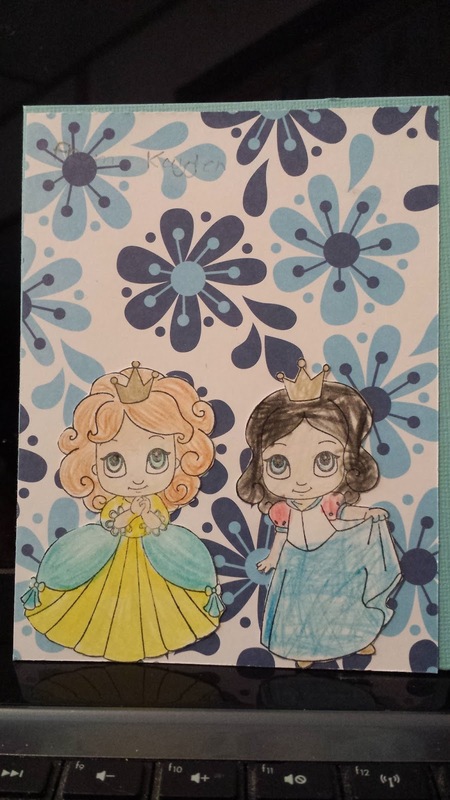 She used colored pencils to color the two princesses. She went through the paper inventory and picked out her design paper and card stock. I am very surprised for no bling on it. I guess she must not have found any embellishments in my stash that she liked for this card. Also surprised she didn't suggest and beg to go shopping for some. Lol. I forgot to take a picture of the card she did for her Daddy. So, I guess this is all for toady. Thanks for stopping in to view our latest creations.